Have you ever wanted to create an embroidery sampler, but weren't sure how? Have you looked for a sampler pattern to follow, but couldn't find one that was just right? Learn how you can design your own custom sampler with these helpful tips! Samplers have a rich history, going back hundreds of years. Traditionally, they have been one of the first pieces of embroidery that a new stitcher might work on. Different regions and eras had some unique styles for their samplers, and those may influence what you picture when you think of a sampler. In modern embroidery, most sampler patterns employ a good number of stitches so that you can learn to work more than just the very basic stitches and show off your skills. And unlike traditional samplers, they can be whatever you want them to be. So, as you start to design a sampler that's all your own, remember that you don't have to follow any rules! With that said, here are a few ideas and questions to ask yourself before you get started. Before you begin, it can be helpful to think about which stitches you want to use in your design. After all, samplers are a perfect place to practice stitching and then display your work! Which stitches do you want to learn or show off? Make a list of them. These 15 stitches are a great place to start. What do the stitches look like? Are they all lines? All scattered stitches? A mix of things? Paying attention to this will help you plan out the sampler. 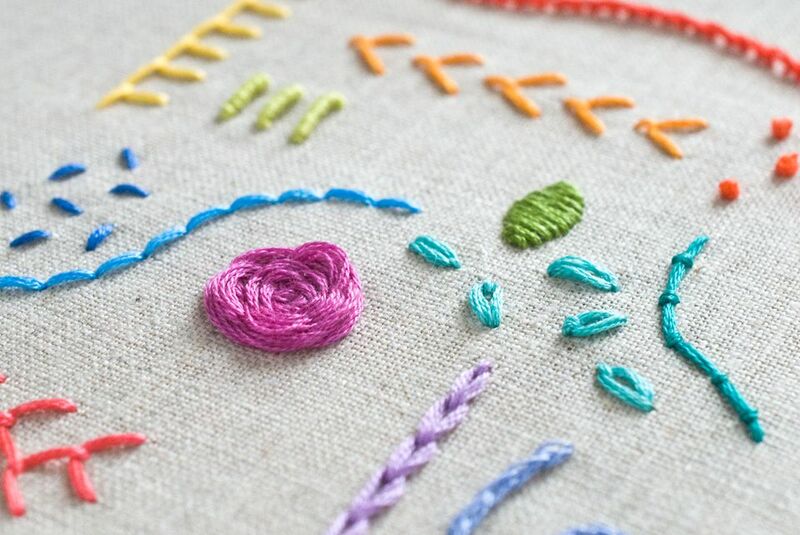 This might sound crazy, but almost any embroidery pattern can become a sampler of sorts. Really! All you have to do is look for ways to incorporate the stitches you want to use into a standard pattern. Where will your chosen stitches fit? Use line stitches for outlines. Use scattered stitches to fill in areas. How can you get creative? It's not always obvious how a stitch might work on an existing pattern. Look at the pattern creatively to find places to add in special stitches as details. For example, spider web stitch might cover the center of a wheel, even if the lines don't match up, or a row of blanket stitch can become the line of ground behind an embroidered flower pot, even when there isn't a line in the pattern. Many traditional samplers have a series of lines, and that's a great general layout idea because it's so easy! But how those lines look can vary and help shape your sampler. Straight lines - Rows of stitches, either horizontal or vertical, make a simple but effective sampler. And you don't have to restrict these rows only to stitches designed to be worked on a line. A row of french knots, for example, works just fine! Curved lines - Make your lines of stitching wavy or draw concentric circles to follow. You could even create a spiral and change the stitches you use as you work along the line. Sections - Divide a hoop into sections as you would slice a pizza or make it a little more freeform. Outlining stitches work well for those dividing lines and you can group other types of stitches within them. You could even skip stitching the dividing lines and only stitch within the sections. These ideas are merely a guide to get you started. The most important element of a sampler is to actually start stitching! Not every embroidery piece needs to be an heirloom; often it's best to have fun and enjoy the learning process. And remember that stitches are easily removed so you can change your work as you go.